« What’s going on in Fukushima? You might remember the randform post “Death of a pub” about the demolishment of a traditional Berlin pub/restaurant/dancehall. Meanwhile the restaurant got replaced by a building which provides room for two small facilities. 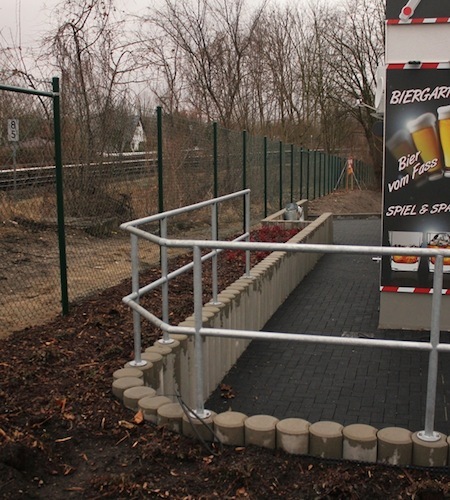 One of the facilities, which hosts currently a little pub called “Schranke” (“barrier” or “level-crossing”) has a little beer terrace/garden next to the buidling. 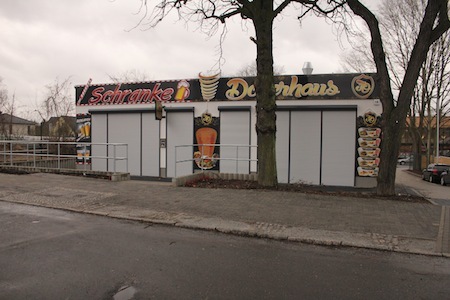 The other business sells Doner kebab and is called “Dönerhaus”. 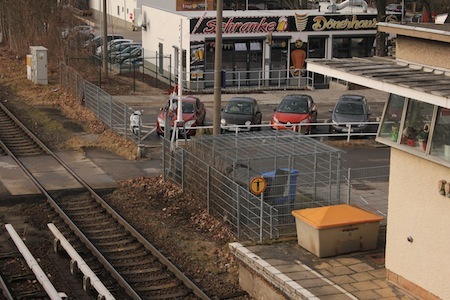 The former garden of the restaurant had been integrated into a parking lot. The images below and above display the new public space situation at the station. Judge yourself whether this is an improvement. Are you angry about the “before and after” development? if yes, with whom of the involved actors are you most angry with? How many dance/music locations are then now left in this neighbourhood? 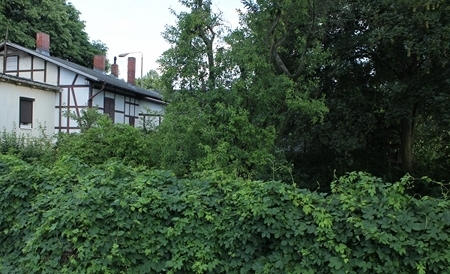 It is the former training facility of the GDR army ensemble called “Erich Weinert”. After “Die Wende” the choir of the ensemble was about 2 years part of the Bundeswehr. After the financing period was over (1994) a private male choir formed and kept existing until 2005. 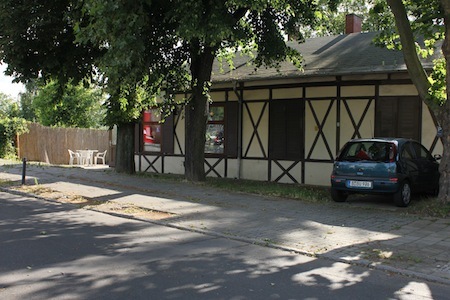 Since briefly after “Die Wende” the building has then been run by an NGO with very little funds. The NGO organized puppet theatres, senior dancing events etc. As far as I know the building belongs to the district and the lease of the NGO has been renewed on a yearly base, which left not much space for bigger investments. Currently the district tries to sell the building to “cultural entrepreneurs”, but as far as I know no “cultural entrepreneur” wants it (which was foreseeable). Since there are tons of car-sellers around the area of the theatre, I expect it will soon be sold, torn down and then turned into yet another car-seller. There is a social neighbourhood centre in the vicinity : http://www.ball-ev-berlin.de/schloss_biesdorf.php run by an NGO for the unemployed and as you can see in the image there are medium sized rooms for little music performances, but it’s open only during the day. On the weekend it’s open only for special events. The NGO is currently also helping out with the nearby refugee home. Then there is the Biesdorf Castle, which was recently renovated and as I described above costly rented out to a semi-private company. Apparently the castle is thought to be a “cultural centre”. I had recently a discussion with someone who often organizes Tango evenings (Milonga) in the centre of Berlin about wether to organize a Milonga there. So I called there and asked for the rental prices and it was WAY above what would be a realistic rental price for organizing such event. The rooms are actually even more expensive than in some hotels in Berlin City Centre. Apriori, until its sold, a Milonga could probably still be organised in the TAP theatre, finally in Buenes Aires Milonga’s also often take place in rather uncosy Gyms etc. and the east german army architecture might even add some “socialist retro-chic”, but the Milonga organizer found that there are too many negative memories connected with this type of architecture for too many people living in the vicinity and if people pay for Milongas they do so only if the venue is half-way “romantic”. So in short dance and music is to a great part finished in this neighbourhood. For completeness I want to mention that there are also occasionally music concerts in the churches like theDorfkirche and a bit away in the Krankenhauskirche (Hospitalchurch). It seems music and dance is not considered important in Germany. I guess you know that Germany performed very badly in the last ESC’s and it even doesn’t seem to be ashamed of that. I.e. CDU won by a big margin. So I guess you maybe saw things a bit overly dramatic. In particular it seems people are highly approving CDU politcs there. Wahllokal 414 is in the vicinity, but in what I would call a very different area. The votes in Marzahn-Hellersdorf differ quite largely, depending on where exactly you are located. So there the right wing party AFD got even more votes than CDU. I don’t think that the death of the pub was influencing peoples federal election votes very much in a concious way. That is usually you base such a vote on more important topics. But I could imagine that more or less unconciously people notice how their public spaces got diminished. The U-Bahn Station was renamed for the occasion of the Garden Exhibition. Furthermore as I wrote here, for the exhibition a whole hill (“Kienberg”) was turned from a public recreational space into a part of the exhibition and there are sufficient rumors that it might not be returned. Marzahn-Hellerdorf is thought to be “densified” and it got in particular densified also with refugee homes. Here some images of that area. “Die Partei” is a satirical party and it got more votes than the green party. And “Tierschutzpartei” means “animal rights party”.